Greenville is no stranger to Southern hospitality and we are excited to be here! River Street Sweets • Savannah's Candy Kitchen brings the best, sweet Southern favorites that guests have come to know and love since the flagship store opened in 1973 in Savannah: World Famous Pralines®, handmade chocolate Loggerheads and homemade ice cream and gelato, just to name a few. Everyone will love our premium Assorted Chocolate Apples, various flavors of fresh popped popcorn, and our unforgettable crunchy, hand stretched Peanut Brittle is also a popular favorite. Our handmade ice cream and gelato are made with fresh ingredients and come in all your favorite flavors. Waffle cones are made fresh daily, and can be dipped in chocolate and candies before they are filled with your favorite ice cream flavors. Handmade southern style candies made fresh, all day, every day, just for you! Personalized gift services, free shipping, Catering, and local delivery available. You may already know that River Street Sweets • Savannah's Candy Kitchen offers the best handmade confections and sweet treats. But did you know that we have a Candy Store and Ice Cream Shop in Greenville, South Carolina? It's true! We are incredibly proud to bring our family tradition and old fashioned candy, fudge, ice cream, gelato, popcorn, and nostalgic candies to residents of the Greenville area near Falls Park on the Reedy. Looking for the perfect Greenville ice cream store to celebrate after your child's soccer team wins the game? Or maybe you're just in the mood to enjoy turtles (we call them Loggerheads! ), candied apples, or handmade saltwater taffy like you enjoyed as a kid? Looking for that perfect gift idea? 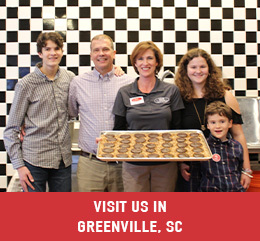 At River Street Sweets • Savannah's Candy Kitchen, we know that a trip to our Greenville candy store is a treat for the whole family. Watch as we make a variety of your favorites or try a sample to taste the quality for yourself. Our South Carolina store proudly carries on the same recipes and traditions you've come to know and love from other locations around the country. River Street Sweets • Savannah's Candy Kitchen is known worldwide for our delicious nostalgic candies and more. Our family-owned franchise offers homemade pralines, fudge, and chocolates in addition to sodas, ice cream, and gelato. If you're in the mood for something a little more on the savory side, we have a full selection of fresh popcorn in a myriad of flavors. Stop by and enjoy a free praline sample while you browse a ton of wonderful gift ideas. 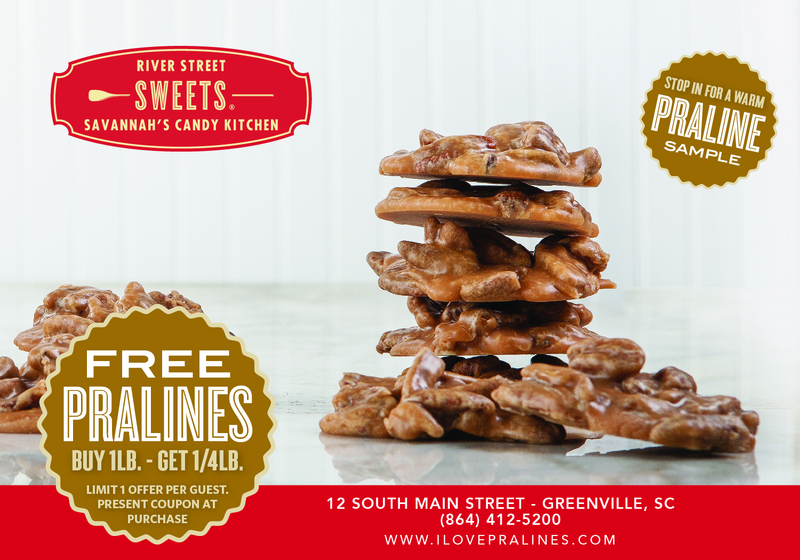 We even offer free shipping across the country so that you can easily share your River Street Sweets • Savannah's Candy Kitchen favorites with loved ones near or far. We are located at 12 South Main Street, which is only a few blocks from famed Greenville landmarks including the American Cigar Factory, the Old Greenville County Courthouse Building, and the Peace Center. Ready to plan your trip to our Greenville candy store but have questions? Give us a call at 864-412-5200 and we would be happy to help.